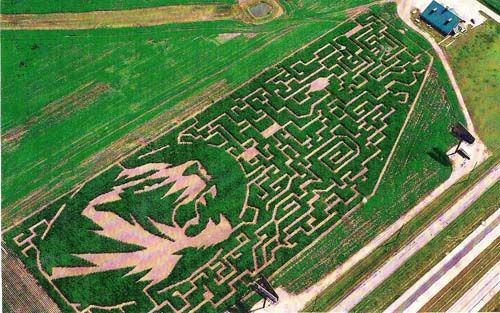 The 2017 Corn Maze was a celebration and tribute to the great tradition of University of Missouri Basketball programs! The 2016 Corn Maze was a celebration of the 100th Anniversary of the United States National Parks Service. This design was finalized in June and our family had fun watching both teams lead their leagues all summer. 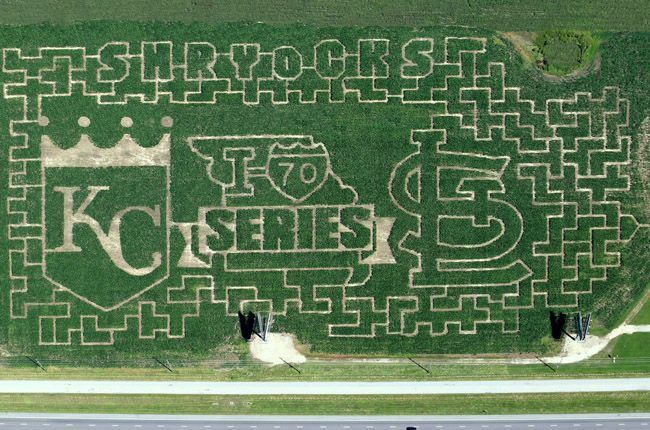 Another I-70 series very nearly happened with both team making the playoffs and the Royals winning it all! Fans from across the midwest came to the maze wearing their “Cardinal Red” or “Royal Blue”! Big thanks to MLB for permission to use the logos. 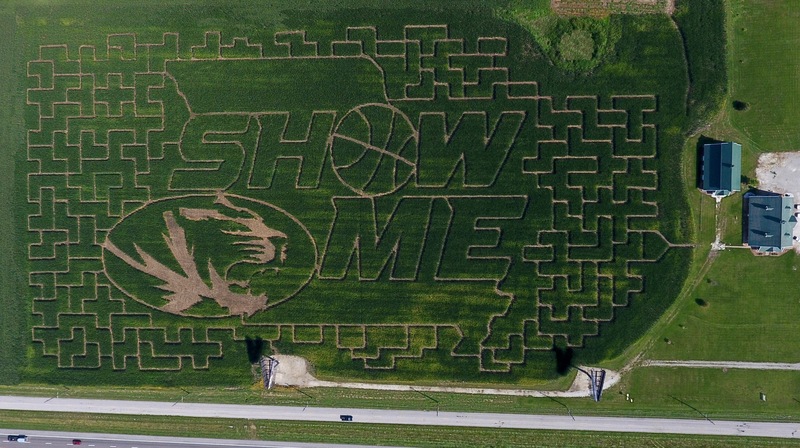 The 2014 maze featured our farm’s favorite tractor, “Allis”! Our Allis Chalmers model D17 tractor used to do a lot of the field work on the farm but now pulls the hayride wagon for visitors. 2013 was a tribute to our past and present service men and women. We should always be grateful for their sacrifice. The new “corn box” and other activities were a big hit. Mizzou’s move to the Southeastern Conference was all the talk in the fall of 2012. At the request of one of the younger Shryocks, Truman the Tiger should be included in the design. The challenge was on….it turned out great! Thanks to MU and the SEC for permission to use the logos. 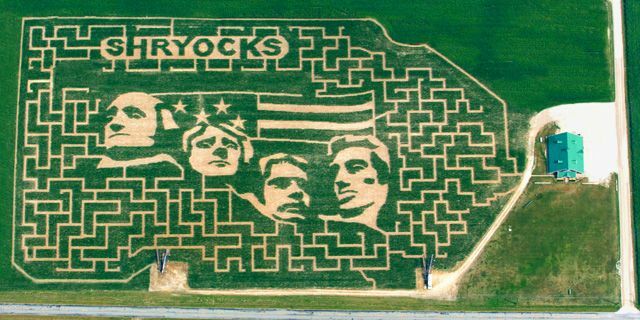 We celebrated our 10th corn maze in 2011 with a tribute to Grandma Shryock. She turned 90 in July and we surprised her at her birthday party with the aerial picture you see on your screen. It was a well kept secret and she was nearly speechless! In 2010 visitors traveled the world looking for checkpoints. Hopefully they took a moment to remember that no matter what our plans are, God is in control of this big world. 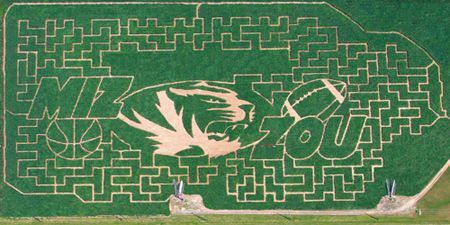 Successful football and basketball seasons at Mizzou inspired the 16-acre 2009 corn maze. The design once again featured the Mizzou logo. Trivia questions covered football, basketball, and corn. The Presidential election theme was a big hit in 2008. Republicans and Democrats alike enjoyed roaming the trails and testing their knowledge of U.S. election trivia. 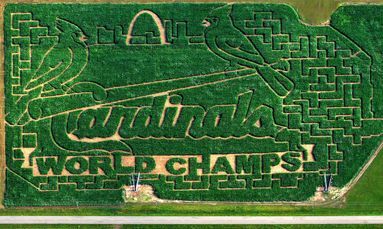 The St. Louis Cardinals World Series win in 2006 was the inspiration for our sixth maze. 2006 marked our fifth anniversary. The “Wild West” themed maze covered 15 acres and featured a larger lookout bridge. 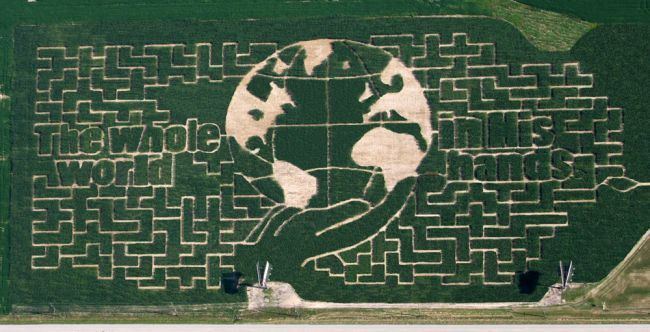 The fourth edition of Shryocks Corn Maze was among the most difficult to create. Cutting the faces of Mount Rushmore was tedious work to say the least! Despite a dry summer and shorter corn, visitors loved the challenge. 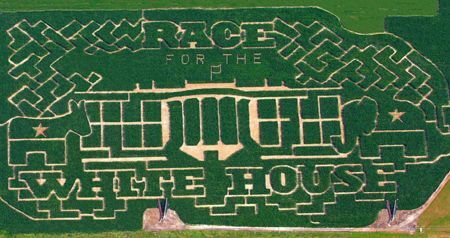 The 2004 maze grew to 12 acres in size. For the first time visitors found trivia questions in the maze. A correct answer helped maze-goers find their way. A wrong answer lead to dead ends! 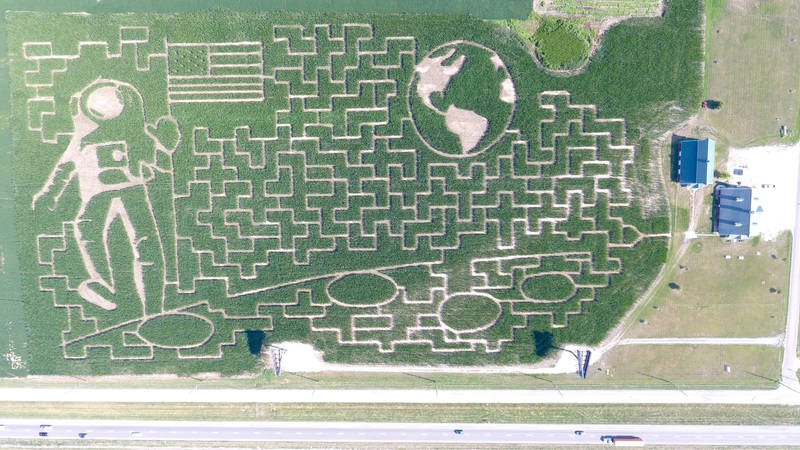 The second maze at Shryocks featured the United States map. Visitors enjoyed finding the checkpoints located at different U.S. cities and landmarks. 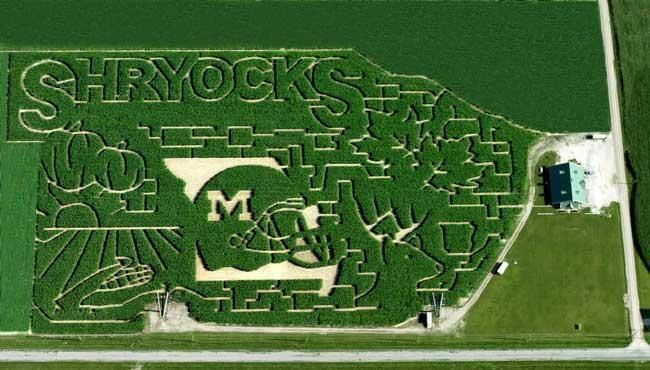 This was the first corn maze at Shryocks and it is still a favorite of long time visitors. 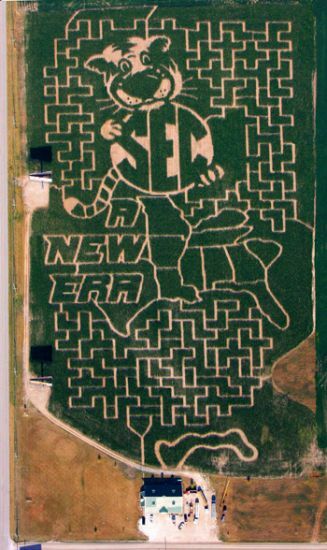 It was only seven acres, but navigating through the Missouri Tiger logo was a-maizing!